Feb. 17, 2010 - This image from NASA's Wide-field Infrared Survey Explorer, or WISE, highlights the dust that speckles the Andromeda galaxy's spiral arms. It shows light seen by the longest-wavelength infrared detectors on WISE (12-micron light has been color coded orange, and 22-micron light, red). Feb. 17, 2010 - This image from NASA's Wide-field Infrared Survey Explorer, or WISE, highlights the Andromeda galaxy's older stellar population in blue. It was taken by the shortest-wavelength camera on WISE, which detects infrared light of 3.4 microns. A pronounced warp in the disk of the galaxy, the aftermath of a collision with another galaxy, can be clearly seen in the spiral arm to the upper left side of the galaxy. 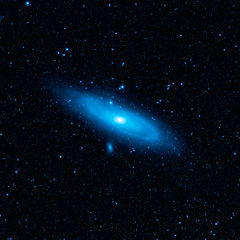 Feb. 17, 2010 - The immense Andromeda galaxy, also known as Messier 31 or simply M31, is captured in full in this new image from NASA's Wide-field Infrared Survey Explorer, or WISE. The mosaic covers an area equivalent to more than 100 full moons, or five degrees across the sky. WISE used all four of its infrared detectors to capture this picture (3.4- and 4.6-micron light is colored blue; 12-micron light is green; and 22-micron light is red). Blue highlights mature stars, while yellow and red show dust heated by newborn, massive stars.